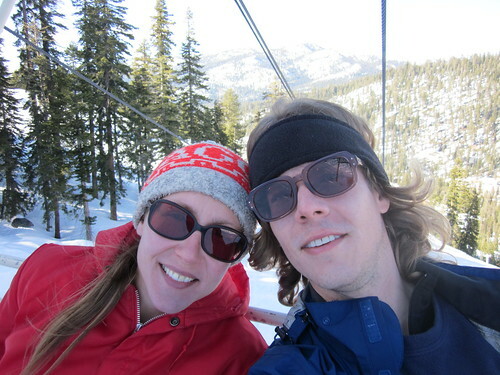 Jenn and Romy: Time To Get New Skis! This year we made a promise to ourselves that we would try and go downhill skiing more often, since we haven't really went for the past three years! Partly that's because its kind of expensive, compared to cross-country (or back-country which is totally free), but partly its because Romy didn't bring his downhill skis when we moved, so renting them would make it even more expensive to go skiing! Sitting on the lift up the mountain. Moreover, given that Romy's old skis were really really old, and he found them in the garbage, bringing them with didn't seem worth it. 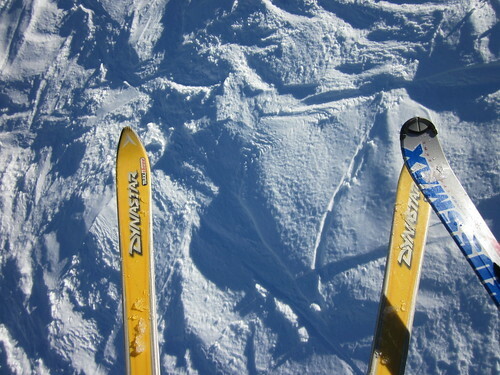 They were the old straight ski style. So we did some searching on Craigslist and found a used pair of skis and boots that weren't that old for pretty cheap. Actually, they were last year's rentals at some ski resort. The boots fit and the skis were the right size, so we bought them and decided to try them out this week. 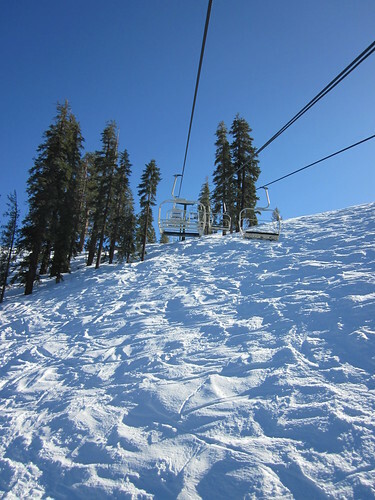 Going up the lift to the top of the mountain. We had a coupon to go to China Peak for half price, which is near Fresno in the Sierra Nevada mountains next to a small lake. It is in the Sierra National Forest but operated with a permit. It was small and cheap, with lots of intermediate and easy runs, so it was the perfect place to try out the skis, not to mention go downhill skiing for the first time in three years!!!! 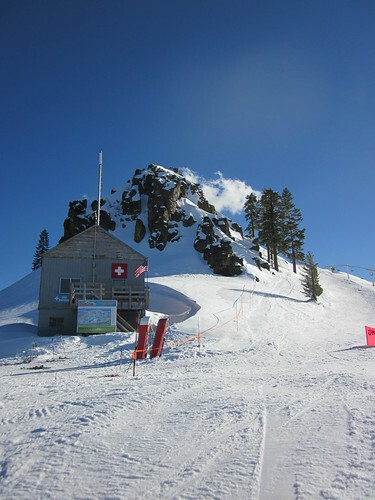 The top of China Peak! When we got there, it was so sunny and warm. We didn't even need hats, scarves, gloves, or eye goggles because there was no wind. It was like spring time skiing except it was still winter. For the first time, I was putting on sunscreen to go skiing. This was totally different then skiing in the midwest where it is usually so cold, that your face is totally covered by hat and scarf anyway, so no need for sunscreen. Except we totally forgot sunscreen, so we bought a little bottle from the store at the bottom of the lifts. 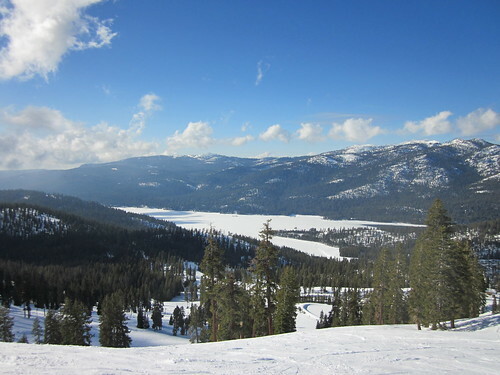 View of Huntington Lake from the ski runs. We really liked China Peak. It was a fun place to go because it was small, and the crowd seemed very local. A lot of college kids from Fresno, and families. There weren't any punk annoying snowboarders who sat in the middle of the run, or dug in deep ruts. Nothing like that. We rented a locker for 50 cent, where we stored our lunch and extra cloths. They were right outside, next to a bunch of picnic tables. We ate lunch outside because it was so warm in the sun.